Singapore’s Ministry of Health (MOH) announced the National Adult Immunization Schedule (NAIS) yesterday. This is a welcome extension of the National Childhood Immunization Programme (into adulthood), and the amendment to allow the use of Medisave (Singapore’s compulsory national medical savings scheme) for these vaccines (up to SGD400 a year) will facilitate take up of the NAIS. Having a NAIS for Singapore is way overdue, but better late than never! Such vaccination schedules are already in place in most developed countries, including US, Europe, UK, and Australia. The European Union’s Centre for Disease Control and Prevention (ECDC) has a webpage that allows one to compare the children and adult vaccination schedules of its member states. It is interesting to note that a separate clinical practice guideline on adult vaccination in Singapore (CPG-V) had been published in 2016. This guideline was put together by experts representing the Society of Infectious Diseases (Singapore), Tan Tock Seng Hospital’s Institute or Infectious Disease and Epidemiology, the College of Family Physicians Singapore, and the Chapter of Infectious Disease Physicians, supported by an educational grant from vaccine giant Sanofi Pasteur. 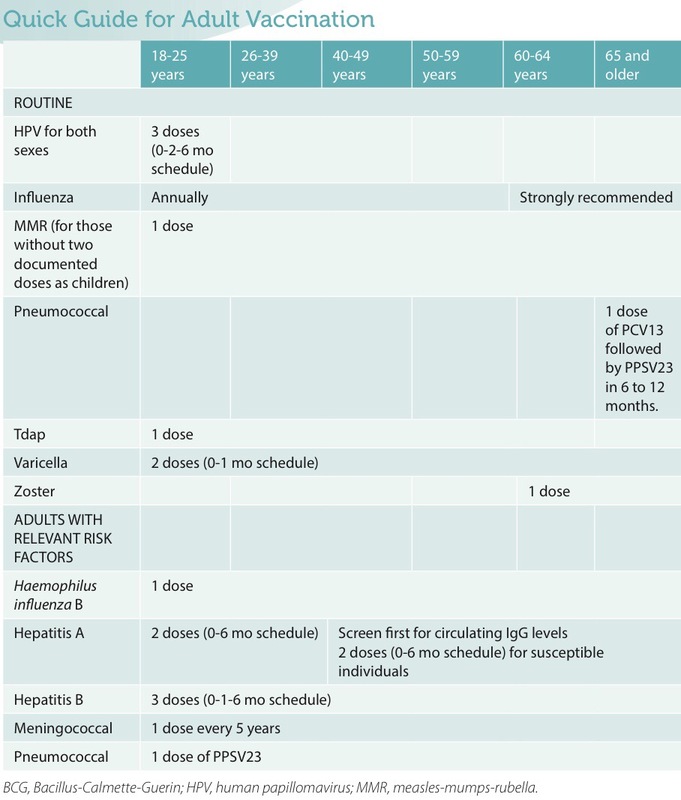 Screen capture from the Clinical Practice Guidelines on Adult Vaccination in Singapore, 2016. How do these recommendations stack up against each other? In general, there is concurrence between MOH’s NAIS and the professionals’ CPG-V. 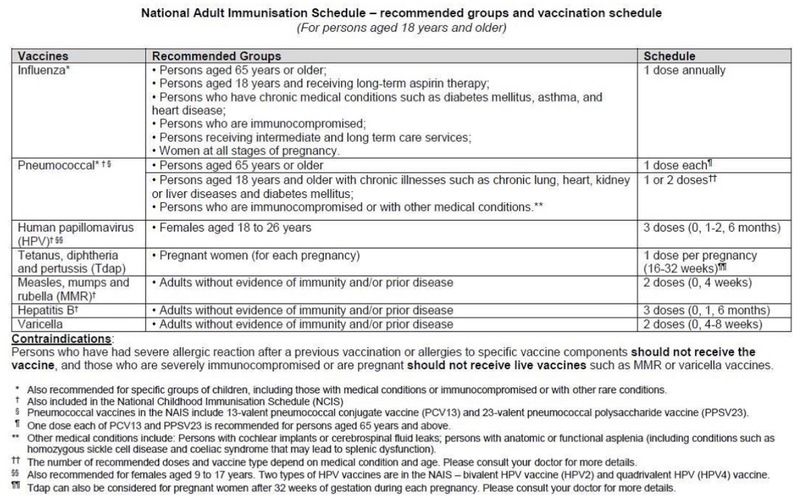 Personally, I think the NAIS has too many “recommended groups” for the influenza vaccine and a blanket recommendation for annual vaccination as per the CPG-V would be more appropriate. The shingles vaccine is also conspicuously absent from the NAIS. Perhaps its higher cost (just over SGD240) and the relatively lower public health impact precluded the vaccine’s inclusion. The CPG-V on the other hand, recommended meningococcal and Hemophilus influenza B vaccination for certain target/at-risk populations but these seem a little too broad given the rarity of these bacterial infections locally. The more general recommendation for hepatitis B vaccination in the NAIS is also welcome. But that’s probably nitpicking excessively. Vaccines remain one of the most cost-effective ways of preventing infectious diseases, and if a sufficiently large proportion of the population are vaccinated, there is a corresponding herd immunity that results in some protection for the rest that are not. Having a “NAIS” is an important first step, and permitting the use of Medisave to pay for these vaccines is very helpful. Subsequent effort by the Health Promotion Board and healthcare workers to raise public awareness and acceptance of adult vaccination will be necessary and complementary. The uptake of vaccines in the Singapore adult population is dismal. Various recently published studies suggest that influenza vaccination uptake (the most commonly prescribed vaccine for adults) is under 30% in the general community, while the adult pneumococcal vaccination rate is easily below 15%. Among healthcare workers – arguably the most educated about vaccines and for whom the vaccination is free in most public sector hospitals – annual influenza vaccination rates are well below 70% even after excluding those few for whom the vaccine is contraindicated. The important public health message here is that vaccines are not just for children, and even adults will benefit from them – if the adults have never been previously vaccinated (chickenpox, Hepatitis B, etc), if the vaccine has only short term efficacy (i.e. influenza), or in those cases where the childhood vaccination effectiveness can wear off over time (i.e. diphtheria and tetanus).